Microsoft Word allows you to place a border on any or all of the four sides of a table very similar to text, paragraphs, and pages. You can also add many type of shading to table rows and columns. This chapter will teach you how to add any of the borders ( left, right, top or bottom) around a table and how to add different shadows to various rows and columns of the table. 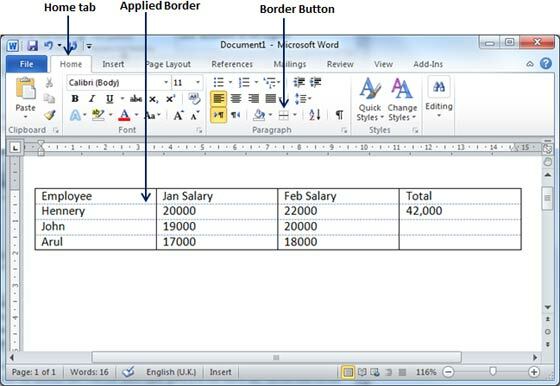 Following are the simple steps to add borders in a table cell available in word document. 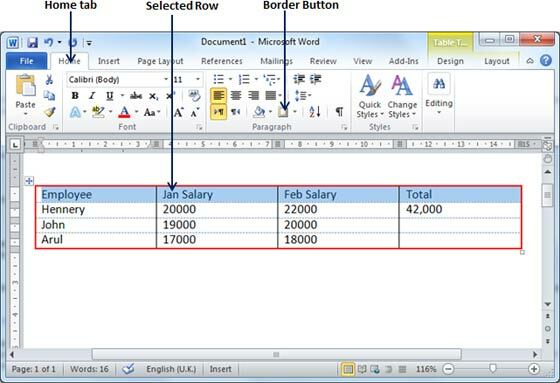 Step (1): Select the table to which you want to add border. To select a table, click over the table anywhere which will make Cross Icon visible at the top-left corner of the table. Just click this cross icon to select the table. Step (2): Click the Border Button to display a list of options to put a border around the selected table. You can select any of the option available by simply clicking over it. Step (3): Try to add and remove different borders like left, right top or bottom by selecting different options from the border options. 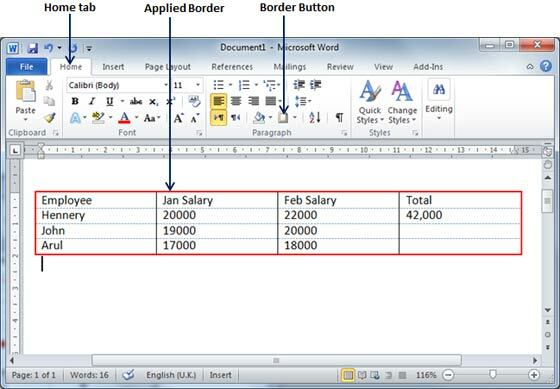 Step (4): You can apply border to any of the selected row or column. You can try it yourself. 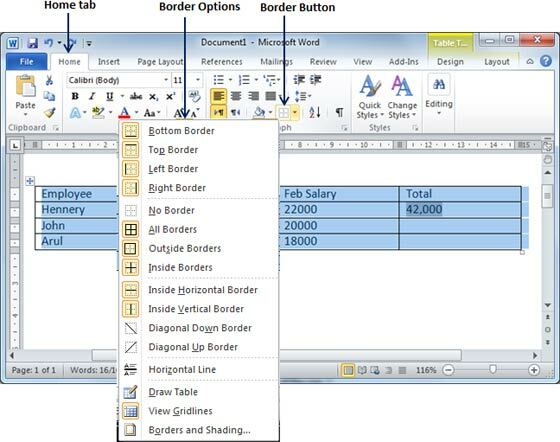 Step (5): To delete the existing border, simply select No Border option from the border options. You can add borders of your choice to word table by following the simple steps given below. Step (1): Click the Border Button to display a list of options to put a border. Select Border and Shading option available at the bottom of list of the options as shown in above screen capture. This will display a Border and Shading dialog box. This dialog box can be used to set borders and shading around a selected table. 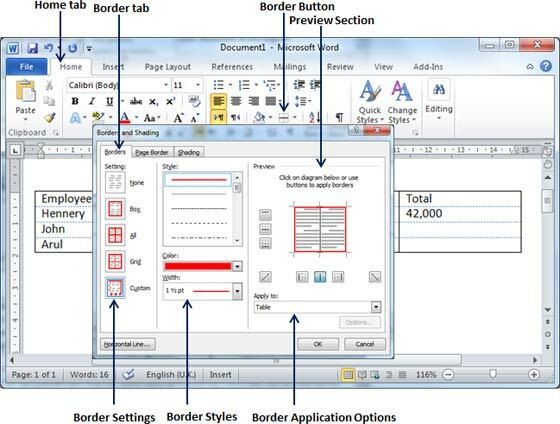 Step (2): Click Border tab which will display a list of border settings, styles and options whether this border should be applied to the table or text or paragraph. Step (3): You can use Preview section to disable or enable left, right , top or bottom borders of the selected table or row or column. Follow the given instruction in preview section itself to design the border you like. Step (4): You can customize your border by setting its color, width by using different width thickness available under style section. Following are the similar steps to add shades on a selected table or its rows or columns. 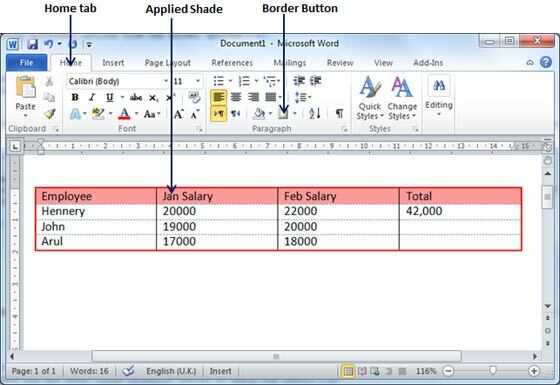 Step (1): Select a row or column where you want to apply shade of your choice. Step (2): Click the Border Button to display a list of options to put a border. Select Border and Shading option available at the bottom of list of the options. This will display a Border and Shading dialog box. This dialog box can be used to set borders and shading around selected row(s) or column(s). 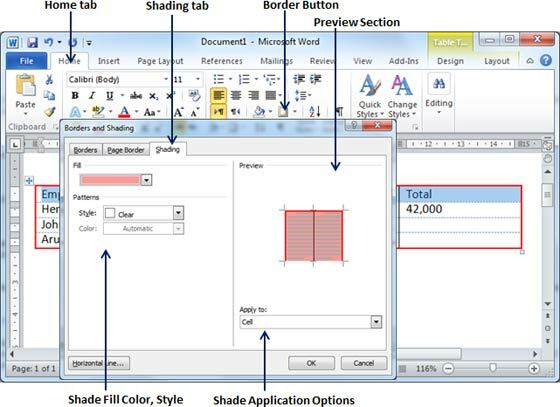 Step (2): Click Shading tab which will display options to select fill, color and style and whether this border should be applied to cell or table or selected text.